The thermal springs at Bath – the only in Britain – were known and probably venerated by the Celtic people living in the West Country before the Roman invasion. Legends tell of one Prince Bladud, an exiled leper, who was cured by the waters uncovered by the pigs he was herding. To the Romans, those famous lovers of baths, these well-situated hot springs were a magnificent attraction. Combining Celtic and Roman godds, they dedicated their impressive bath complex to Sulis Minerva, throwing offerings and curses into the steaming waters for the deity’s attention. 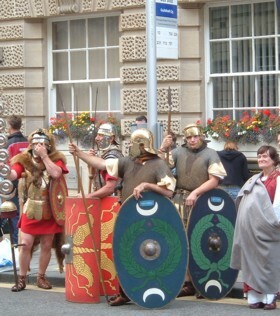 Bath, called Aquae Sulis, grew as a town, and excavated burials have demonstrated that the cosmopolitan settlement was home to travellers and merchants from distant parts of the Roman Empire. Many sites in the West Country claim connection with the stories of King Arthur, and Bath is proposed by some as the site for the Battle of Mount Badon. In the Middle Ages Bath was a mildly prosperous wool town. Pictures from the time show the thermal springs in use, although dirty, crowded and indecorous. Bath’s glamorous heyday came in the Georgian period. The town became England’s most fashionable resort, where Society came to take the waters in the Pump Room, to dance and flirt at the Assembly Rooms, to gamble, gossip and promenade. The town was rebuilt, and became an architectural showpiece. Although Bath’s fashionable lustre faded, the town remained a genteel destination. During the twentieth century excavations began to reveal the ancient city under the Georgian developments, and Bath began to attract tourists in large numbers from all around the world. At the start of the twenty-first century, Bath is a World Heritage Site, famous for both archaeology and architecture. Two of the most notable developments of recent years have been the opening of a new thermal spa and of a popular Christmas market.